Sound Transit plans to add light-rail cars to help cope with the expected crush of two busy September days, when sports fans should boost ridership above 80,000 passengers. Sound Transit expects to put nearly every available light-rail car on its tracks during two “mega-event” days in September, when the system could swell with more than 80,000 passengers. On Saturday, Sept. 17, the Mariners, Sounders FC and University of Washington Huskies football team all play, adding to normal crowds for a late afternoon. On Friday, Sept. 30, the Mariners and Huskies will overlap with afternoon commuters, as well as UW and Seattle Central College students who have returned for fall quarter. The crush comes as light-rail ridership grows faster than predicted, at levels not expected for two more years. An average 63,577 passengers took light rail each weekday in the spring quarter, compared to 36,058 a year earlier. Rush-hour trains are often packed, since the University of Washington and Capitol Hill stations opened in March. 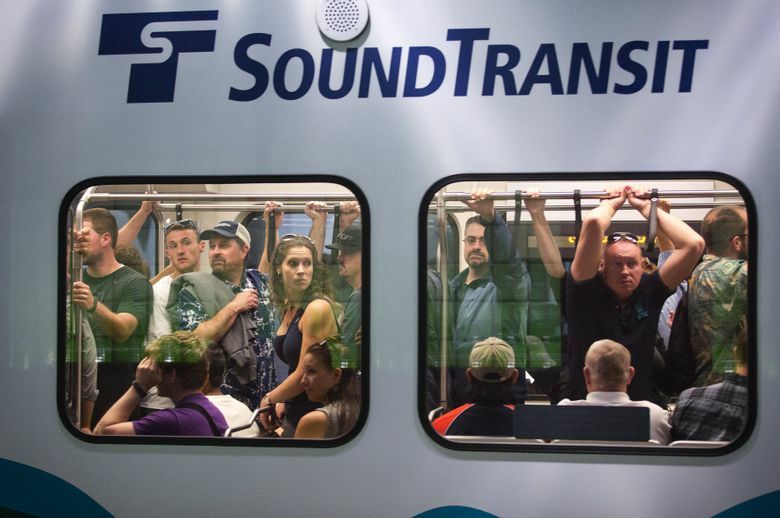 A standard evening commute uses 45 of the Sound Transit’s 62 railcars, plus a couple of two-car relief trains that dispatchers can send out to replace a stalled or delayed train. The remainder are undergoing maintenance or cleaning or are just held back so their parts last longer. • On Sept. 17, there will be at least normal Saturday service, with a three-car train arriving every 10 minutes. Planners can add more trains as needed, because fewer buses run through the shared downtown transit tunnel on weekends, spokesman Bruce Gray said. • For the Friday crowds on Sept. 30, there could be 12 three-car trains and seven two-car trains, arriving as often as every six minutes, plus a two-car train in reserve. (Gray calls that an “inverted schedule” compared with the standard of 12 two-car trains and seven three-car trains at peak.) But officials might make every train a triple — for a total 57 of 62 railcars running, and a two-car reserve train. At Husky Stadium, transit crews will work to control the flow of people from the plaza down into the UW Station postgame, to prevent hazardous crowding on the platforms, Gray said. In addition, transit staff will help riders at the Tukwila International Boulevard Station, and likely the new Angle Lake park-and-ride station that opens Sept. 24, Gray said. Along with enforcement and security guards, they will help newcomers to the system use the ticket-vending machines. Supervisors will watch the ballgames, as well as their video feeds from the trackway, to determine if relief trains are needed. “If it’s a nail-biter, everybody leaves at once. If it’s a blowout, everything spreads out,” Gray said. Sound Transit CEO Peter Rogoff said train-use patterns will depend partly on whether the Mariners are in a tight wild-card race by late September. Jonathan Hopkins, spokesman for the volunteer advocacy group Seattle Subway, said ridership on one of those busy September days could hit 100,000 passengers. More than 80,000 people took light rail on two Fridays this year: Aug. 12, the night of a Guns N’ Roses concert, and April 8, boosted by Emerald City Comicon. Mariya Kargopoltseva, transportation analyst for the fiscally conservative Washington Policy Center, said she believes the rail-capacity issue is “manufactured,” because thousands of Northeast Seattle bus riders were compelled to use light rail by bus cuts and routes that were shortened to feed the train stations. “They could easily serve that need with buses, but they’re choosing not to,” she said. Preliminary data from King County Metro Transit show a total loss of 9,000 daily boardings on 42 routes affected by the UW and Capitol Hill stations (and 4,000 more transfers from buses to trains). In all, according to Metro, there are 15,000 more bus and light-rail trips daily in the area than before the UW-Westlake light-rail corridor opened. Sound Transit says it doesn’t own enough vehicles yet to run three-car service all the time. However, Rogoff defended the past purchasing timelines and fleet size. “We have enough railcars to meet demand and surge up. You don’t want taxpayer dollars to buy enough railcars to prepare for the busiest possible day of the year,” he said. The going rate is nearly $6 million per railcar. Light rail will be more efficient later this decade, when buses are removed from the downtown tunnel, and cause less delay to trains, he said. Even last week, Metro diverted some incoming buses Wednesday afternoon from the downtown tunnel to the streets, to avert slowdowns affecting light rail and express buses. And an additional 122 railcars are now being ordered to arrive before the U District, Roosevelt and Northgate stations open in 2021. By then, four-car trains will run all day.